This is what lives in my knitting backpack - a carabiner which has all of my handy supplies. I'm ready for any knitting situation with my handy supply pack, lol. You can see a tiny Swiss Army knife - I use the scissors all of the time, and I've been known to use the tweezers to loop through a dropped stitch, until I can work my way back to it. You see the Plumber's Tape - ready to patch up the join on a circular needle - and you can see the 7 jillion yarn-loop-stitch-markers. 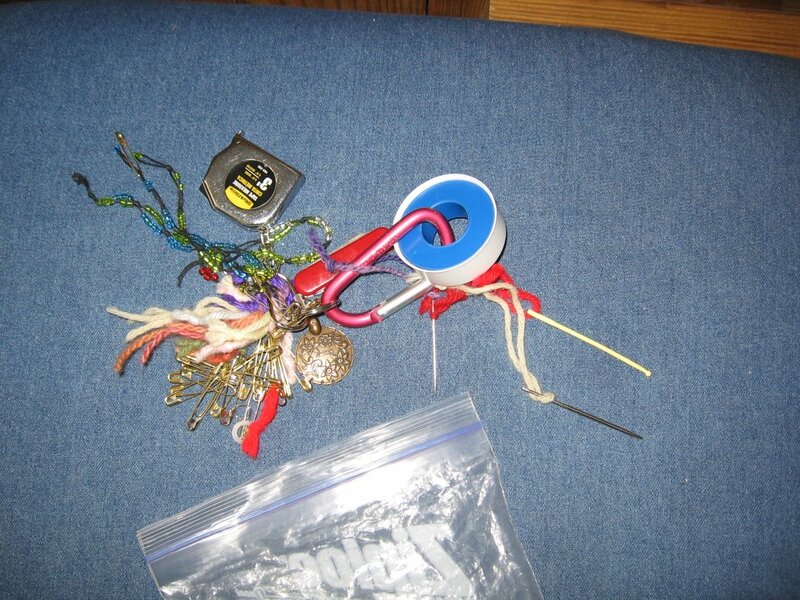 My tapestry needles are ready, and so are my most favorite tools - coilless safety pins. Add a couple of knitting abacuses and I'm ready for anything!